AFTER I wrote The Destruction of Dresden (1963) and the history of the Nazi V-weapons program, The Mare's Nest, I investigated the history of Adolf Hitler's atomic research program, inspired by a little printed monograph published by Professor Werner Heisenberg in Naturwissenschaften and then in Nature. I carried out the interview work in the mid 1960s. Heisenberg, Otto Hahn, Kurt Diebner, Carl Friedrich von Weizsäcker and the other members of the rival atomic research teams were still alive; Paul Harteck was teaching at the Rensselaer Polytechnic Institute in Troy, New York. A major problem was that all the available archival wellsprings on the project -- like the armaments ministry files, and the Heinrich Himmler papers -- seemed to have dried up in 1942, when Albert Speer effectively put a damper on it. But from the private diaries and interviews of the men themselves it was plain that they had worked diligently on it until the very end of the war. My publisher, William Kimber, was eager to publish what I had already assembled -- "You have to draw a line under the work somewhere," he said -- but I convinced him to let me follow my hunch, that the bulk of the 1943-1945 papers would be found in secret US archives, either in the custody of Dr Samuel Goudsmit, head of the 1945 ALSOS investigation, or in the archives of the Atomic Energy Authority at Oak Ridge Tennessee. Both suppositions proved correct. I stayed for several days as Goudsmit's guest at Brookhaven Physics Laboratory on Long Island, where he had several file cabinets of top-level Third Reich documents on the project; and the archives at Oak Ridge had all the scientific papers, including the Kernphysikalische Forschungsberichte of the team led by Prof Walther Gerlach. Both agencies provided me with copies or originals of the documents. I in turn placed them all on microfilm (rolls DJ29-32)so that they would be available to others, along with all the interview transcripts. The original papers originally went to the Institut für Zeitgeschichte in Munich as part of the Sammlung Irving; without consulting me, however, the IfZ broke up these research papers and donated the very rare scientific reports to the scientific collection of the Deutsches Museum in Munich. All of these papers are of course now accessible to researchers without any restriction imposed on my part. I acknowledge that this book has been superseded in part by a much later study on Heisenberg composed by American historian Thomas Powers of Vermont, who in turn acknowledges the debt he owes to The Virus House and my early research. The conformist American historian Mark Walker of Schenectady, NY, and Israeli academic Laurence Rose wrote lesser studies on parallel themes; I allowed unlimited access to my own interview transcripts and other research files to Professor Rose for his own work. I am pleased to say that Heisenberg published a glowing half-page review of the book, in the Frankfurter Allgemeine Zeitung -- not bad for a sophomoric physics failure, to earn praise from a Nobel Prize winner, or so I thought at the time. 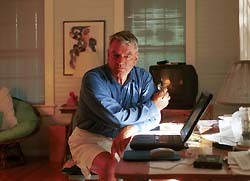 Decades later, going through the papers of the late Lieutenant General Leslie Groves, head of the Manhattan Project (author, Now it Can be Told), I found that he too had typed a lengthy review of my book, concluding that the German scientists had labored under precisely the same bureaucratic difficulties as his own team -- with one difference, of course: His team succeeded. An American edition was published by Simon & Schuster (New York) as The German Atomic Bomb. The corresponding German edition, Der Traum von der deutschen Atombombe (Bertelsmann), was a bestseller in Germany, serialised for many weeks by Der Spiegel. Michael Frayn's longrunning play (2001) on Niels Bohr was partly based on the book, as he acknowledges. IN 1981 the German authorities in Haigerloch opened a museum on the site of the last experimental atomic pile built by Heisenberg's team. 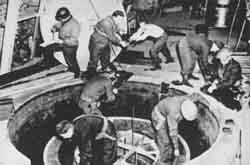 They asked me for technical assistance and the unique photographs in the book, many of which had been provided to me by Michael Perrin (later chairman of Burroughs Welcome group in London), who headed the MI6 team which dismantled the pile and investigated the scientists (see photo). The museum's brochure paid full credit to me for my pioneering work in writing the first history of the project; many years later, in 2001, the German left wing and the Verfassungschutz (Office for the Protection of the Constitution) insisted that all reference to my name be removed from the brochure and museum.